The Banshee (IPA: /ˈbænʃiː/), from the Irish bean sí ("woman of the síde" or "woman of the fairy mounds") is a female spirit in Irish mythology, usually seen as an omen of death and a messenger from the Otherworld. Her Scottish counterpart is the Bean Nighe ("washer-woman"). The aos sí ("people of the mounds", "people of peace") are variously believed to be the survivals of pre-Christian Gaelic deities, spirits of nature, or the ancestors. Some Theosophists and Celtic Christians have also referred to the aos sí as "fallen angels". They are commonly referred to in English as "fairies", and the banshee can also be described as a "fairy woman". According to legend, a banshee wails around a house if someone in the house is about to die. Traditionally, when a citizen of an Irish village died, a woman would sing a lament (in Irish: caoineadh, [ˈkiːnʲə] or [ˈkiːnʲuː]) at their funeral. These women singers are sometimes referred to as "keeners". Legend has it that, for five great Gaelic families: the O'Gradys, the O'Neills, the O'Briens, the O'Connors, and the Kavanaghs, the lament would be sung by a fairy woman; having foresight, she would appear before the death and keen. When several banshees appeared at once, it indicated the death of someone great or holy. The tales sometimes recounted that the woman, though called a fairy, was a ghost, often of a specific murdered woman, or a woman who died in childbirth. Banshees are common in Irish and Scottish folk stories such as those recorded by Herminie T. Kavanagh. They enjoy the same mythical status in Ireland as fairies and leprechauns. 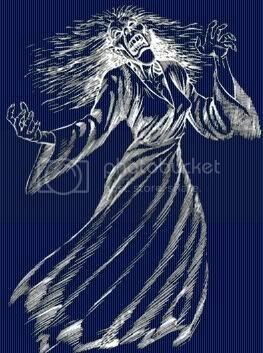 The term Banshee is an anglicization of the Irish bean sí - "woman of the síd" or "woman of the fairy mound". The Scots Gaelic version of the name is usually Bean Nighe - "washer-woman". Both names are derived from the Old Irish ben sídhe, "fairy woman": bean: woman, and sidhe: the genitive case of "fairy". Síd in Irish, and Sìth in Scots Gaelic, also mean "peace", and the fairies are also referred to as "the people of peace" - Aos Sí or Daoine-Sìth.